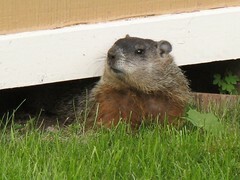 A feckless rodent thug, similar to the one pictured above, going by the name of “Punxatawny Phil” is holding Spring hostage in Central Pennsylvania. He declared his verdict in the middle of the town square, with a henchman dressed as a Victorian Era Dandy working as his interpreter. It’s not clear immediately what “P-Phil” wants, or what his minimum offer for the release of Spring will be, but I’m hoping Jack Bauer will take a break from defiling DC Geography to get on this case, immediately. This entry was posted in: The Daily Feed, The Great Outdoors, WTF?! That rodent thug is holding spring hostage in Western Pennsylvania. As a Central Pennsylvanian (AKA an Pennsyltuckian), I resent the association with such a Bill Murry-esque place. you know what i have to say? P-Phil belongs on FU Penguin. I think that might be the funniest blog I’ve seen all day. Like CuteOverload, but with less babytalk.